The Niger Delta Avengers, NDA, which vowed on Monday to continue to obstruct all avenues by President Muhammadu Buhari to export crude oil because of his refusal to address its demands, blew up the Qua Iboe 48-inch oil crude oil export line belonging to Exxon Mobil in Akwa Ibom State in defiance of him. Que Iboe returned to operation after a month long force majeure in June, buoyed by the now aborted ceasefire between the Niger Delta Avengers and government, but the militant group, which claimed responsibility for the attack, wondered why the International Oil Companies deceive themselves with government’s false sense of security. Qua Iboe which crude oil grade stood at a $0.90 per barrel premium had witnessed strong trade interest since the release of its provisional August programme on June 27. Same day, Shell Petroleum Development Company, SPDC, shut down the Trans Niger Pipeline, one of the two major pipelines that carries the Bonny Light crude grade for export following an outflow in Gio, Ogoni land, Rivers State. The company had only last week resumed export on the pipeline after almost two months of force majeure, following the restoration of production to Bonny Terminal. Officials said the company was working on a joint investigation into the leak on Trans Niger Pipeline. 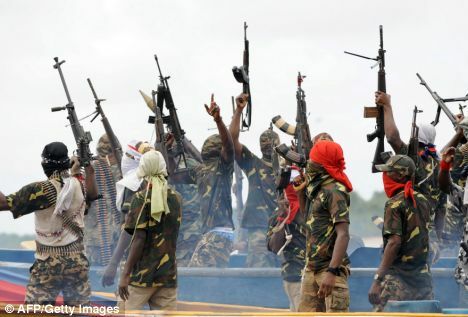 However, the militant group, which said it was closely monitoring repairs on damaged pipelines, attacked the Nembe 1, 2 and 3 Tedeba Brass trunk lines in Bayelsa and Rivers states on June 8, after the company carried out repairs on leaking Nembe Creek Trunk Line, NCTL. It also bombed the Forcados 48-inch Crude Export Terminal in Delta State afresh, last month, because Shell flouted its order not to carry out repairs of any sort on its installations damaged by the militant group until government addressed its demands. Series of deliberate attacks on facilities of Chevron Nigeria Limited and Nigeria Agip Oil Company, by the militant group to stall export had also hampered oil production by the companies. The gain of the temporal ceasefire by militants, which saw an increase in oil export, has disappeared with the recent attacks. The armed forces are reportedly considering the next line of attack against the Avengers. The Chief of Army Staff, Lt-Gen Tukur Burutai, and other security chiefs are not disposed to dialogue with militants. They are supposedly mobilizing for a combined fresh offensive by all the relevant security agencies.